There are many variations of technical questions that can be asked in an interview; however, there is a specific approach a pilot should take in preparing for this section of the interview. 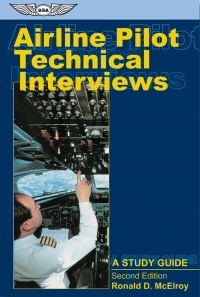 Author Ron McElroy provides an abundance of exercises in the areas of: mental math, approach plates, AIM, regulations, weather, systems and aerodynamics, and cockpit situations to analyze and resolve. Aspiring professional pilots will be prepared to display their flying skills during the simulator ride, as well as their aeronautical knowledge during the face-to-face oral questioning. Not only will this book ensure better performance during a technical interview or test, but you may learn something new that will help you fly the line a little better. Soft cover, illustrated, glossary and index included, 144 pages.